Founded in 1989, Volito brings over 25 years of industry experience in cage-free products for egg production. 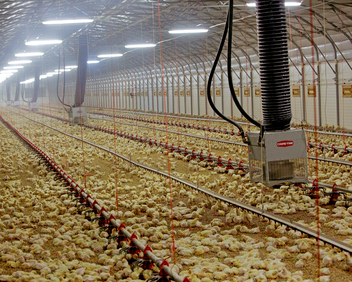 The Dutch company started with aviaries in 1989 and soon added a line of nesting products for floor production to its cage-free system offering. The company grew methodically over the years by adding first metal fabrication capabilities in order to manufacture the aviary systems and later wood fabrication for the wood nest components. Today Volito holds an enviable position in the EU market for cage-free products. Chore-Time’s parent company, CTB, acquired Volito in 2016 in order to bring Volito’s products and expertise to the rapidly emerging U.S. cage-free market through Chore-Time’s distribution network. As part of the new partnership with Chore-Time, Volito has already introduced a new floor layer nest designed specifically to meet the demands of the U.S. floor layer market. Along with the nest, Chore-Time is proud to begin offering Volito’s highly successful pullet and production aviary systems to the U.S. cage-free market. Volito’s aviary products for pullets and layers have been refined through the years. Today’s product line includes patented designs for outstanding bird care and performance. In addition, Volito’s years of cage-free bird management expertise will provide U.S. growers with invaluable training and support. With Volito’s proven cage-free product line and bird management expertise coupled with Chore-Time’s leadership in feeding and ventilation technology, all backed by Chore-Time’s team of independent distributors, egg producers can choose the Volito/Chore-Time combination with confidence.